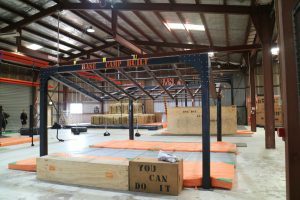 It seems that after the hype of Australian Ninja Warrior, there are obstacle gyms starting to pop up all over Australia, but there are a few that have existed since before the hype. 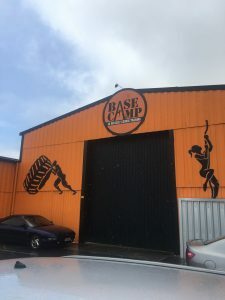 Base Camp in South Australia is one of those gyms. Situated in Royal Park, just outside of the CBD Base Camp is a behemoth of a fitness facility who’s bright orange exterior makes it impossible to miss. Upon arriving at Base Camp, I was quickly greeted by owner and Australian Ninja Warrior Grand Finalist Luke Williams, who despite seeming to have a million jobs to tackle at once was incredibly welcoming and was great to have a chat to about obstacle racing and ninja. 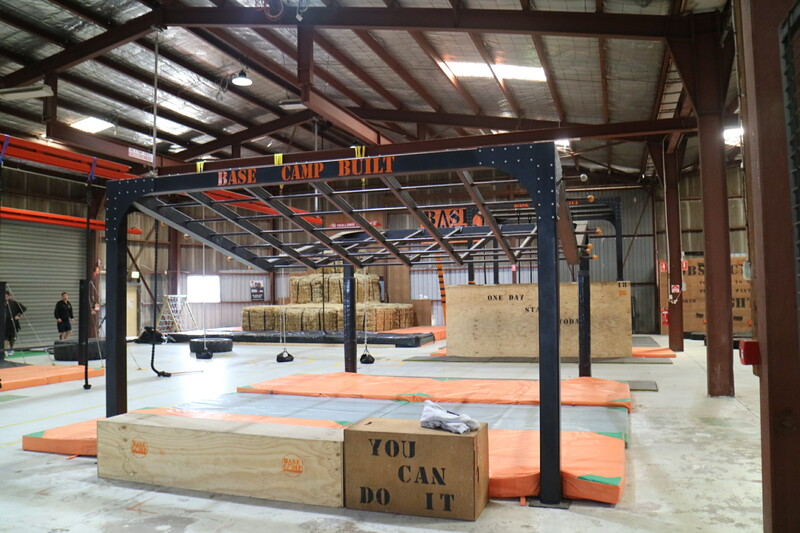 Before you can take on the obstacles at Base Camp you’re escorted into the video room where you’re given a safety briefing and technique demonstration for every obstacle in the facility so that you know exactly what to do once you’re on the gym floor. This went for around 8 minutes and was narrated/acted out by the master Ninja Luke Williams himself. The video itself was a really effective way to answer all of those frequently asked questions in a quick and engaging way. After the video I was free to play (I say play because when I’m around new obstacles I revert into a child-like giddy state where I run around aimlessly). I did have to set myself some limits today though as I was running Night Attack at Adelaide Oval (more on that later) and didn’t want to totally burn my arms and legs out. To say Base Camp is huge inside is a total understatement. I was totally in disbelief when I walked into the massive warehouse, there were obstacles as far as the eye could see. As well as a massive array of obstacles Base Camp also has a fully equipped functional training area with all of the equipment you need to build a strong body to defeat the obstacles. I started out trying to loosen up swinging on the decline/incline monkey bars, which had 6 rows of monkey bars side by side (some with bars missing to increase the difficulty). Being a stubborn male, I elected to go straight for the hardest option which wasn’t a problem until the last move required a upward lache of around 6ft to get to the final bar. From here I took on the 2.4 and 3.0m walls which really test your commitment to jumping and kicking off of the wall to maximise your jump height and grab the top of the wall and climb over. 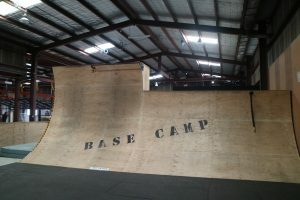 Then I went over and took a shot at the Base Camp Warped walls which are greatly scaled so that all ability levels can conquer at least one of them. Whether it be the small warped wall with a hanging rope to assist in getting up, or the overhanging bar on the tall warped wall, it means that everyone can feel a bit of success before pushing on to the harder challenges. Upon getting to the top of the Warped Wall a sensor is set off and if you climb down the back and head forward to the next obstacle, Base Camp has a full blown wind tunnel for you to run through (what other gym has that?). Just off to the right of the warped walls Base Camp has built their own Cliffhanger, floating doors and circuit board which will really test even the best ninjas grip strength. Next up for me was Traction Control (or for those of us old enough to have watched Gladiators, the Travellator). 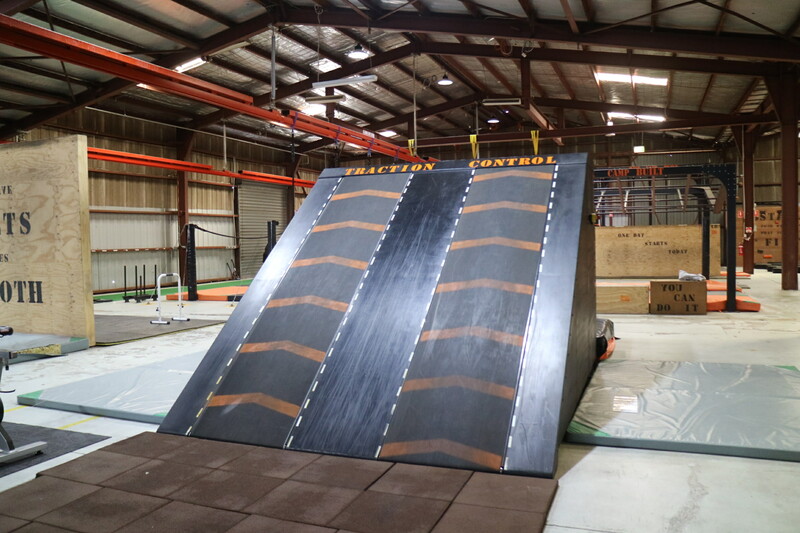 I don’t know why Base Camp has this, but I’m glad that they do, because running up the conveyor was like achieving a childhood dream of being on Gladiators. After this I tried the Salmon Ladder. It’s great to be able to train on Salmon ladders in different gyms because every single one is a totally different beast. The Base Camp variant had an incredibly light bar and rungs that were very close together and it moved a lot with your body weight. This meant that doubles came a lot easier than they would on others but it definitely took some getting used to. Lastly, there was a massive steel peg, peg board and wall traverse down the back end of the facility which was a great grip endurance challenge. The steel pegs made a really cool change from timber variants because they slid in and out of their holds so smoothly and easily and made an incredibly satisfying clunk when they connected. As I was training there was also a massive delivery of steel and timber for a brand new Kids Ninja Gym and Pilates/Yoga studio they are planning to install which looks to be incredible if it’s anything like the rest of the facility. One of the most underrated aspects I noticed about Base Camp (and an incredibly important part of any gym) was the community that exists around it. I didn’t get to see this in the gym as I was there during a quiet time, but at True Grit’s Night Attack event there were Base Camp t-shirts and singlets absolutely everywhere. Seeing their members (some of which included some of the most successful ninjas of season 1) all getting together and supporting one another through an obstacle race showed that their members were really getting more than just some equipment in a gym, there were getting a massive community which challenges and supports each other. 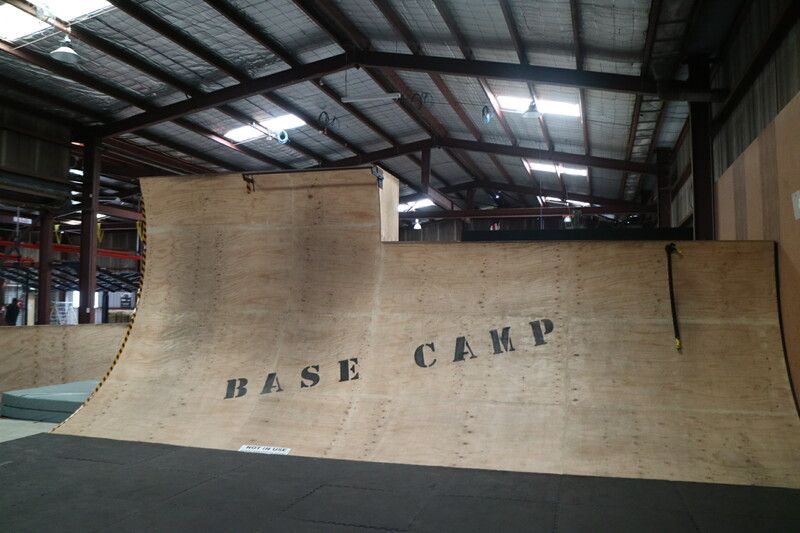 Finally, here’s a video of my great experience at Base Camp. If you’re ever in the Adelaide area you should definitely drop in and check it out. We are in Adelaide. My 7 year old son is interested in ninja warrior and is willing to practice as long as it takes to get to the ninja warrior kids competition. I couldn’t find any training program for kids. Hi. Im interested in a membership and what are the costs? ← ANW Fantasy – guess who crushed it? → Is the Ninja Community even all that special?